The Camino del Cobre (The Copper Canyon Trail) will be a long-distance trail that highlights the tourist wonders of the Copper Canyon region - nature, culture, history, and the opportunity for personal challenge. Extending from the northern waterfalls to great southern canyons, the Trail will follow the rim of the world's largest canyon system - with chances to visit local villages and historical sites. When completed, the Trail will span a number of days in its entirety. Now hikers can follow the trail markers for their own route of 1,2 or more days, starting in the eco-tourist center of Creel, Chihuahua, Mexico. The Camino del Cobre is still in the very early stages of its development. It still faces many challenges. 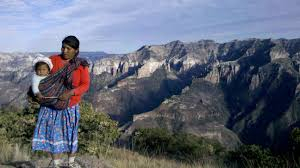 It will benefit significantly from the participation of any individual or organization committed to the benefit of the Copper Canyon and the Tarahumara people and willing to devote their energy to helping build the trail and its impact in the region.